Sustainable phytoremediation is a vital element of the new applied science field of ecological engineering; so are bioremediation and other biotechnologies used in sustainable waste management. For the first time in the long history of engineering, this new field will strive to develop a new discipline of engineering that values equally ecosystem and human needs. All existing engi neering disciplines, including environmental engineering, have completely or partially overweighted human infrastructure in a manner that may not completely sus tain life on this planet. 'Ecological engineering', first conceptualized by H. T. Odum in 1957, is environmental manipulation by human kind using small amounts of supplementary energy to control systems in which the main energy derives from natural sources or ''the design of human society with its natural environment for the benefit of both.'' This defini tion clarifies why photoautrophic, and, to a degree, heterotrophic processes like sustainable phytoremediation and bioremediation are important components of this new field. Thus, ecological engineering is an appropriately holistic concept to organize and understand how different biotechnologies can be best used to sustainably manage wastes. The degree of self organization by different species, populations, and communities of organisms is the key to understanding how phytoremediation fits into the sustainable ecological engineering of waste management. 'Self engineering' is the reorganization, substitution, and shifting of ecosystem dynamics and functions to adapt to superimposed environmental stresses and limita tions. Adapting to ambient conditions, species, populations, and communities of plants, animals, and microorganisms 'self design' or control the local environment. Examples include the development of microclimates under plant canopies, control of soil geochemistry by roots and micro bial communities, control of water levels in soil by evapotranspiration, and control of metals speciation in soil to prevent enzyme poisoning. • Ecosystem structure and function are governed by and can be quantitatively related for design and analysis to dynamic forcing functions like availability of sunlight, water, organic matter, nutrients and other building blocks of life, and toxins and many other stresses. • Materials, especially carbon and nutrients, are recycled in ecosystems, making these most self sustaining. • Sunlight and the stored heat of the planet are sustainable sources of energy used to organize cells, organisms, populations, communities, ecosystems, and the Gaia (the planetwide ecosystem) that results in the degradation in quality of some energy to unusable states, thus increasing the system entropy, and requiring a con stant and consistent source of energy for sustainability. • Ecosystem processes have characteristic temporal and spatial scales that are usually fundamentally different from the normally static, stable, steady state designs of human infrastructure over limited geographic areas. • Ecosystems are dominated by momentary, diurnal, seasonal, annual, decadal, geologic, and other timescales and these pulses are often highly productive in combined energy and matter, and all types of diversity. • Ecosystems are extensively linked and coupled spatially and dynamically with extensive feedback to form an Earth dominating web of life known as Gaia (the preeminent example of ecosystem self engineering and self design), whereas human infrastructure (exclusive of the environment) is not yet as extensively linked worldwide except by the Gaia. • By definition, an 'ecosystem' is an arbitrarily defined web of life with every organism linked and coupled to everything else (including the ambient envir onment or habitats, overlapping ecosystems, and forcing conditions or adjacent ecosystems at all boundaries) with extensive and dynamic feedback and resilience, conserva tion of materials, and flow and degradation of energy quality from one trophic level to the next in all food chains systemwide. • Organisms and cells maintain internal 'homeosta sis' (equilibrium achieved by adjustment of physiologic, enzymatic, and synthetic processes) of biological and physiological functions by biochemical conversion and control of sunlight energy, organic matter, other sources of energy, and nutrients, which in turn are based on ambient conditions. • Ecosystem feedback, resilience, a buffering or waste assimilative capacities are defined by the evolutionary and life histories of the cells and organisms involved. • Enzymatic, proteomic, and other biochemical diversity enrich feedback, resilience, a buffering or waste assimilative capacities of an ecosystem. • Ecosystems are typically defined by geographic edges (shorelines, ridgelines, and similar geographic features) which are normally 'ecotones' (transition zones between commu nities dominated by greater diversity and numbers or mass of organisms), so that forcing conditions from adjacent ecosys tems and the surrounding environment are most evident and quantifiable and thus ecosystems are usually most vulnerable at these boundaries. A good example of natural self design was observed at the Alabama Army Ammunition Plant near Talladega. Built in 1942 and operated during the Korean conflict, wide spread trinitrotoluene (TNT) contamination of soil and water was observed from the 1960s to the 1990s cleanup. The extensive contamination caused large bald spots of soil that were effectively sterile, the drainage from which turned local streams pink with the photodegradation pro ducts of TNT. Beavers dammed at least one on the pink tinged streams allowing parrot feather (Myriophyllum aquaticum; see Figure 1) and other wetland plants to grow, spread, and break down the TNT and by products. By the early 1990s, these waters and sediments in the ponds and streams were free of detectable TNT. The sterile bald spots, reported to be up to 60 m (200 feet) in diameter in the 1960s, were reduced to about half of this diameter by the early 1990s by encroaching forests. 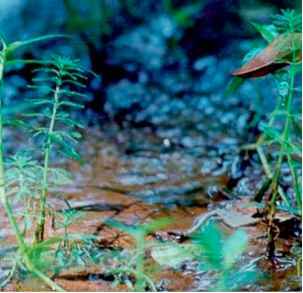 Figure 1 Parrot feather (Myriophyllum aquaticum) growing in a natural wetland. Concentrations were of the order of 10 000 mg of TNT per kg of dry sterile soil. As of 1991, hardy grasses grew at the margins, followed by small pine (Pinus spp.) trees. Some of the grasses and small trees succumbed to the highly toxic soils, probably during periods of higher environmental stresses (drought, frost, rainfall saturation of soil and mobi lization of highly toxic TNT, and other stressful events). These plants usually fell into the sterile areas to increase soil organic carbon at the ecotone, allowing other plants to grow further inward year after year. Concentrations were on the order of 1000 mg kg 1 of soil in the ecotone. Adjacent to the ecotone were more mature pines that transitioned to hardwoods in a short distance as part of the normal succession in southern forests. In the reforested fringe of full size trees and underbrush, TNT concentra tions were on the order of 10-100 mg kg 1. To ecologically engineer the cleanup of this site, the natural process of breaking down TNT in the sterile soil could have been accelerated using limited energy in collecting and trans porting local forest accumulations of detritus to the sterile bald spots to get indigenous plants growing. The beaver ponds downgradient could have been kept in place to continue to capture and break down the residuals draining from the bald spots until all contaminants were removed from the soil and wetlands. 1 m (3 feet) deep across the plume, the depth of which was approximately 3-3.5 m (10-11 feet) below the ground surface. Within months the transpiration of the fast growing cottonwoods seasonally halted the contaminant plume as evidenced by recurring depressions in the water table. At the end of 5 years, about 30% of the plume was removed by the trees and microorganisms. Scaleup of this pilot plantation of approximately 900 trees by a factor of 4 or more is likely to completely halt this small plume. But the complete dewatering of the aquifer by transpira tion is neither necessary nor desirable. Some of the TCE residual can be dehalogenated by enhanced vadose zone reduction and spurring of microbial growth from the added trees. Complete aquifer dewatering will dry up an adjacent stream and cause the death of some of the trees due to lack of water. Remarkably, the cottonwoods self engineered the vadose zone redox conditions to at least 3 m (10 feet) deep by the release of sugars and other simple exudates. The switch to reducing conditions favored the microbial deha logenation documented at the site. Seasonal pulses of percolated, oxygenated rainfall prevented any buildup of carcinogenic vinyl chloride and other intermediates. 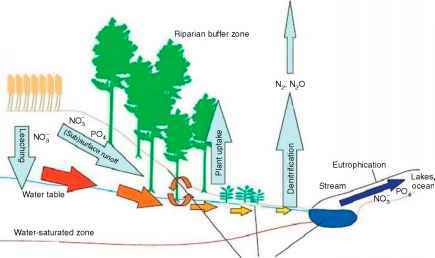 Contaminants taken into the trees with the transpiration stream were mineralized by dehalogenation and oxidation pathways. Elevated chloroacetic acids in tree leaves were temporary accumulations not expected to persist or cause toxicity.